My Holiday Ireland offers a range of tours that can be tailored to the needs of any sports team or supporters group. We are a 100% focused to show you the real Irish hospitality in organizing and hosting a tour for your group. We can organise a tour for any kind of sports group. Below are sample sports trip packages for you to look at! Just let us know what you need us to organise and we’ll do it! As Ireland’s leading Inbound Tour Operator, since 1971, our team of experienced Irish travel experts and vacation advisors have but one goal – to create that lifelong dream Irish vacation that you will remember forever. Whether you are interested in coach tours, self drive tours of Ireland, sporting holidays or any other Ireland vacation packages we can tailor a package to suit your requirements. You have found a creative Irish inbound team to partner. We will ensure that your unique Ireland vacation becomes more than just a dream. If you’re looking for another way to travel to Ireland, contact us here free of charge. We’d be more than happy to help you organise your dream 2017 holiday! 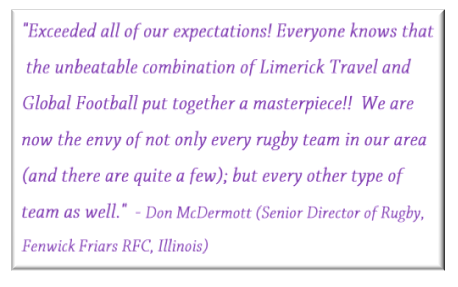 Our team of experienced Irish travel experts and vacation advisors have but one goal. We want to create that lifelong dream Irish vacation that you will remember forever. All you have to do is take the first step and contact us today! We can give you ideas for your sports trip packages today! Looking for a vacation outside of Ireland? Have a look at Let’s Go Travel!